McGuire didn’t hear or see any cicadas. Neither did most of the people CNN Radio spoke with in Virginia, Washington D.C., Pennsylvania, New York and Connecticut. After months of hype over what was billed as a wonder of nature, replete with billions of cicadas, many residents along the Atlantic are shrugging their shoulders. “It’s called cicada envy,” said Professor Mike Raupp, an entomologist at the University of Maryland who also runs the website Bugoftheweek.com. Raupp means the sense that millions of people expect to see cicadas in the major cicada years, yet sometimes the cicada broods are limited to very small patches. Raupp took CNN Radio to a patch of land in Virginia that was screaming with the creatures. He explained that while the cold spring may have delayed the cicada emergence a week or so this year, by now all the cicadas that are coming are here. If you don’t have any in your yard by now, they won’t be arriving. So then, where can you hear one? Raupp suggested the Internet. As in our story. [5:03] “Bzz, bzzz, bzz, bzz, bzzzzz,” sound of one cicada, astonishingly similar to the noise created by a dial-up modem. They are also very ggod to eat !!!! Cicadas everywhere which is a good sign of immortality, in the Chinese feng shui it means good health and longevity when you see them. They are not creepy but these insects are better than cricket. I live near Quantico, VA, 30 miles south of DC and we have thousands of them... Of course you will not have them in newly (relatively new constructed areas). Any land distrubed in th elast 17 years will have less cicadas... My neighborhood is 6 years old so we don't have many but behinde my house, we have uin touched woods and we have had thousands of cicadas... They sing all day... Morons. Of course you won't have them in DC! Idiots! You should probably educate yourself before you make stupid statements. 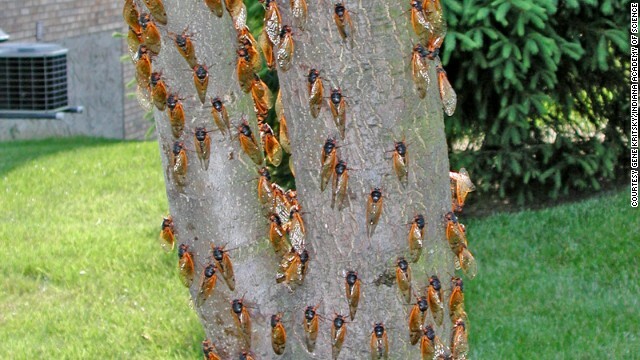 We had thousands upon thousands of cicadas in my NW DC neighborhood in 04.
smash them because you're scared like a little girl? Anywhere in Jersey. Don't bother with NYC why would anything natural want to live there? So like I went back home to New Mexico by the Arizona State-line and they have emerged greatly. So many holes in the ground and so many shells left behind. Than you look up in the trees, there they are just singing away. And they are so huge. Pretty cool to see them once again, it's been many years. Brought back childhood memories. They were all over Staunton River State Park near South Boston VA during the week of 5/26 to 6/2. They were extremely noisy on 5/26 and tended to die down somewhat as the week progressed. I saw lots of them flying around in the Park; I saw one land on a tree. Several landed on the back deck of the cabin I was staying in. I don't know where these people are looking, but Northern VA is full of them. Not one cicada heard/seen Magarity & Rte 7 entire area. None seen/heard all way down on Magarity Rd to Anderson Rd and none Anderson to Rte 123/Dolly Madison. Ditto Magarity to Griffith Rd in Pimmit Hills. And, none along Rte 7 to 7 Corners. All these areas are in N.VA. I know they are harmless, but I had one land on me and buzzed me. Boy did I jump! I miss them out here in the west! And talk about stupid comments–where is that jackhole calling them 'prostitutes' for following their natural cycle. That was just about the most pathetic example of douchebrain I had ever read! Here in N. California we have "Crickets" instead but part of the same species. Boy are they noisy!! There all over my yard in Orange County NY. Sounds like Star Trek phasers going off all day. Amazing creatures. There are many different "broods". I do not remember this one as being one of the more impressive. Check out http://www.cicadamania.com/where.html for more information about the cicadas when and where. I have experienced Brood X and it was very brutal! If you live in Florida, they do not follow the periodical population life cycles, and adults emerge every year from late spring through the fall. They are emerging in droves in Lower Columbia County, NY and are amazing to watch as they transform into adult cicadas! Loud too! Doesn't anyone think that maybe we have almost driven them to extinction? Maybe they should be on the endangered list. I wonder if someone did a study on the previous years that had cicadas emerge in small patches, would we discover that large broods in those areas did not return in succeeding years? Do we not realize that any tree that has been cut down or up rooted within the last 20 years cannot sustain a population of cicada larva? Additionally, cicadas can not live on just any species of tree. There habitat has literally been destroyed. Replanting young trees is not helpful to insect that reproduce as cicadas do. How many forests have you seen cut down in the last 20+ years? Just a personal note: The first time i saw them, there were millions and millions of them! It was amazing! Like nothing i have ever seen in my life, still to this day. The second time i saw them, there were small patches here and there but many, many square miles of developed land had absolutely none; complete silence. The third time i was old enough to see them, this year, i have seen NONE!!!!!!!!!! I lived in the same exact place for over 40 years.. I saw cicadas last weekend in Ladysmith, VA! If you want to see/hear cicadas come to Southern MD. They are very loud!